City and county directories provide annual listings of residents, occupations and addresses. The following directories are in the Public Library of Cincinnati & Hamilton County (PLCH) Virtual Library. Search by name or address. You can browse them online, or download them to your computer. Cincinnati: 1819, 1825, 1829, 1831, 1834, 1836/1837, 1840, 1842, 1843, 1844, 1846, 1849/1850-1941 (except 1852 and 1854, when no directories were published). Norwood: 1896, 1902, 1909/1910, 1911/1912, 1913/1914, 1915/1016, 1917/1918, 1919/1920, 1922/1923, 1924/1925, 1926/1927, 1928/1929, 1930/1931, 1932/1933, 1934/1935, 1937/1938. Hamilton County: 1887, 1889, 1891, 1893, 1897, 1899, 1901, 1905, 1907/1908, 1909/1910, 1911/1912 (and 1915, which is not online) have separate alphabetical lists for each town and village. 1939 and 1940 each have one alphabetical list for the entire county outside Cincinnati. 1861-1923 Cincinnati directories are on Fold3, and Ancestry has 1861-1960 Cincinnati directories. Both are available to PLCH card-holders. Published directories are at PLCH and the Cincinnati History Library and Archives (CHLA), which has the 1915 Hamilton County directory (not online). Ancestry has fourteen Cincinnati directories between 1942 and 1960. Published volumes of post-1941 Cincinnati directories, Hamilton County directories (1942, 1944, 1946, 1957-1964) and Cincinnati suburban directories (1965 to present) are at PLCH and CHLA. PLCH has the 1954 Norwood directory. If you don’t find someone in Cincinnati, they may have lived in an area that was outside the city at that time but was later annexed. For example, until 1905 residents of Bond Hill, Evanston, Hyde Park and Winton Place (now part of Cincinnati) were listed in county directories. 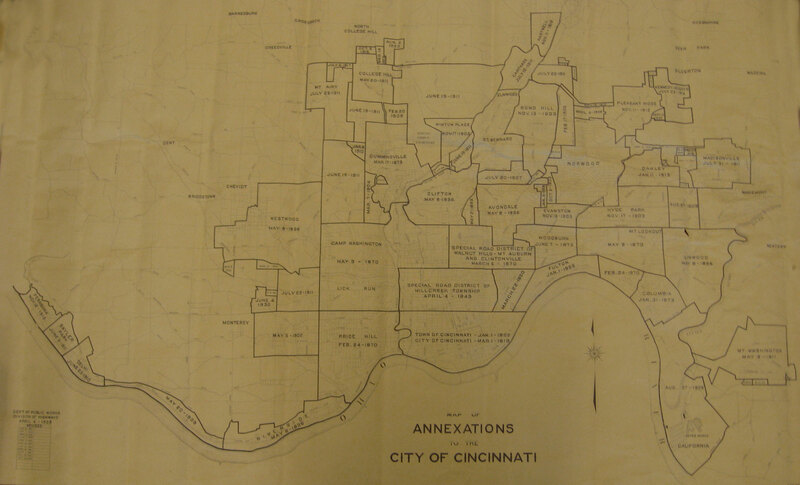 Check annexation dates for Cincinnati neighborhoods on a 1944 map. Street names were changed occasionally. The names of twelve streets with German names were changed in World War I. A list of old street names with new names given around 1910-1930 can help identify name changes. Many civil marriage records in Hamilton County do not identify the church where the marriage took place. You may be able to find the officiant’s affiliated church (and perhaps a church record with more information) by checking the directory for that year. Bill Graver, A Guide to Cincinnati City Directories: What, Where, and Watch Out! Cincinnati Historical Society, 1998. Bill Graver and Deb Cyprych, “Cincinnati and Hamilton County Directories,” The Tracer (September 2006), 65.